Workplace Giving is a program which allows employees to make regular donations through their pay. By using the payroll systems, employers together with their employees can make small regular donations pre-tax to a charity. Your payroll department is responsible for overseeing the transaction – hassle free! Companies can add value to their own staff’s Workplace Giving by implementing a matching gift program. 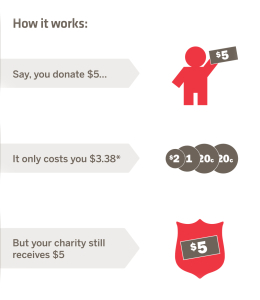 Matched Giving means that businesses match employee donations dollar-for-dollar. This is an incentive for staff to donate through a company Workplace Giving program, raising more funds to help end youth homelessness. According to Charities Aid Foundation, more than 60% of employees who donate through Workplace Giving say their primary motivation to do so is that their organisation is matching their donation. Speak to your payroll team about their workplace giving program and nominate a set amount to be deducted to The Salvation Army’s Oasis Youth Support Network from your salary. If they don’t already have a form available, you can download The Salvation Army’s Oasis Youth Support Network registration form here and send it to your payroll department.